Skin brightening serum | preciousandmakeup.org || it's just a beauty thing. The fall & wintery weather can be absolutely brutal on your skin. The damage range from dryness, dullness, & losing your skin’s glow. With Artistry’s Illuminating Essence, you can regain that youthful glow within just two weeks. Illuminating Essence can prevent & help repair discoloration (such as redness & dark spots), aging, as well as visibly making your skin brighter. This product contains a special blend of antioxidants that helps protect skin as well as preventing discoloration & signs of aging. Just apply a small amount on on your face & neck area in the morning & at night and watch your skin transform. 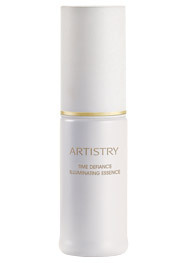 Artistry Illuminating Essence retails at $62.85 (for a 1 oz. bottle). It’s a $27.15 price difference from Lancome’s Bright Expert Intense Brightening Spot Correcting Serum ($90 for 1 oz.) & a $62.85 price difference from Shiseido’s White Lucent Concentrated Brightening Serum ($118 for 1 oz.). Artistry’s Illuminating Essence is one of the most inexpensive (but still high end) skin brightening serum out on the market. Get your youthful glow black with Artistry Illuminating Essence & get the fast results you want today.